Limoncello is a wonderful and popular Italian liquer. It has been produced for more than one hundred years, at least, and traces its origins to the coasts of Southern Italy. Made from fresh lemon zest (and traditionally only the lemons of the Amalfi Coast), it is incredibly refreshing as either an after-dinner digestivo or mixed in a tempting cocktail. Today, it is easy to make limoncello at home if you have the time, or if not to purchase delicious limoncello ready-made from local suppliers or on-line retailers. 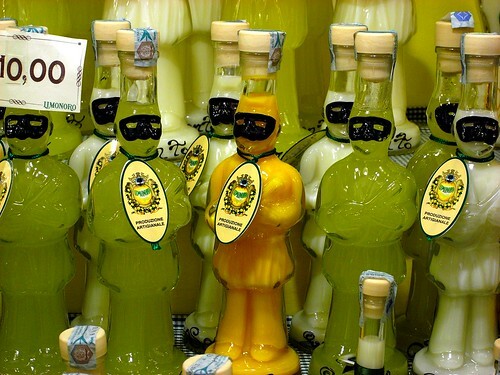 It's also a popular souvenir to pick up while in Italy as limoncello is typically sold in colorful, decorative bottles. 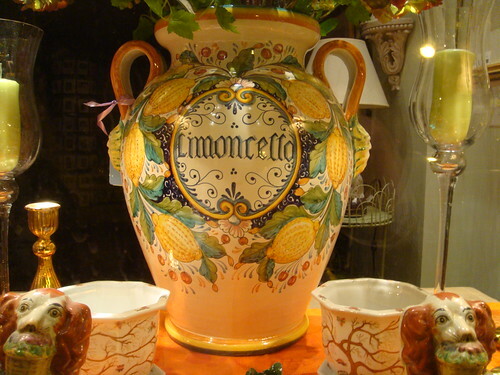 Here you can learn more about limoncello: how it is made, it's history, and also shop for beautiful limoncello-related products perfect for collectors and enthusiasts everywhere. Image above: Homemade limoncello. Photograph by erik forsberg on Flickr, licensed under Creative Commons Attribution 2.0 Generic. Limoncello is primarily produced in Southern Italy, and historically made from the zest of only Femminello St. Teresa lemons - otherwise known as Sorrento lemons. These lemons are prized for their fragrant skins. 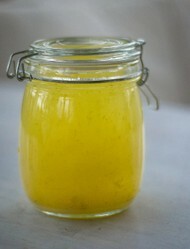 To make limoncello, the lemon zest is steeped in grain alcohol until its flavorful oil is released. 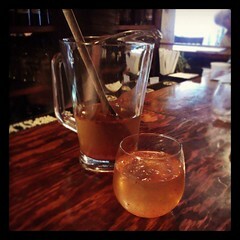 Then, the flavored alcohol is mixed with a sweet simple syrup to make it palatable. 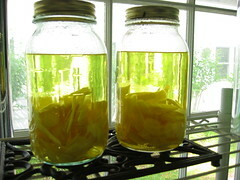 The resulting liquid is bright yellow in color although its clarity and viscosity (thickness) is affected by different factors such as the temperatures of the alcohol and syrup when they are mixed. 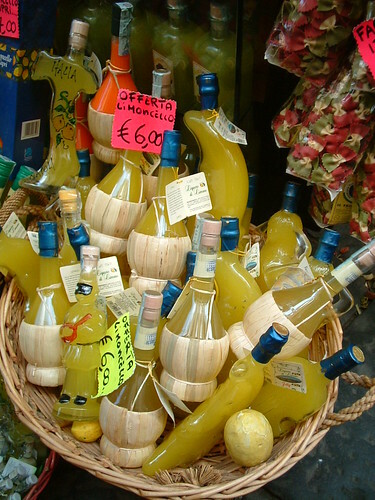 Limoncello is one of the most popular liquers in all of Italy, generally enjoyed as an after-dinner digestivo. It can be drunk on its own chilled, or mixed in cocktails where the flavor of the lemons shines through without the sourness typically found in lemon juice. 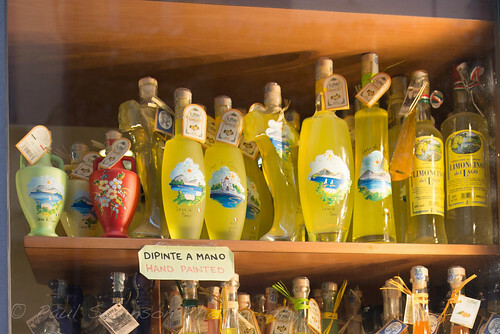 Souvenir and gift shops throughout Italy are often filled with colorful bottles of limoncello in all shapes and sizes, sometimes hand-painted with beautiful scenes of Italy. Limoncello is generally inexpensive to buy and wonderful to enjoy on a hot summer evening, at the end of a satisfying meal. Great to keep as souvenirs - long after the limoncello is gone! I've never had it before, but it looks delicious! I've tried limoncello, but it's not one of my favorite drinks. Perfect for enjoying limoncello at home! Limoncello can be enjoyed in different styles of glassware. Traditionally, along the Amalfi Coast, it is served in chilled ceramic glasses. It can also be served in standard shot glasses or elegant flutes. eBay is a great place to look for collective limoncello glassware in a variety of shapes and styles. Here are just some currently running auctions. Limoncello is relatively easy to make at home, even if you don't have access to Sorrento lemons. Just about any kind of lemon will do fine. Home recipes typically call for either high-proof vodka or Everclear for the alcohol base. You can find a variety of different recipes for limoncello online; here are just a few you can read through for information and ideas. Recipe from the Food Network celebrity chef. Recipe and historic information from "What's Cooking America". The Best Limoncello is Homemade Limoncello! Well-illustrated recipe with step-by-step information. Watch these recipes in action! Learn to make great limoncello drinks! From Bobby Flay comes this colorful cocktail, perfect for a BBQ gathering or party. A delicious drink enlivened by Pomegranate Molasses. 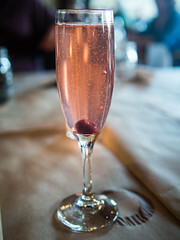 Impress dinner party guests with this elegant after-dinner drink! Take an Italian spin on an old classic. What's more refreshing in the summertime than watermelon? Watermelon cocktails! A beautiful recipe from Giada de Laurentiis. Combine herbal and sweet flavors with this surprising drink. 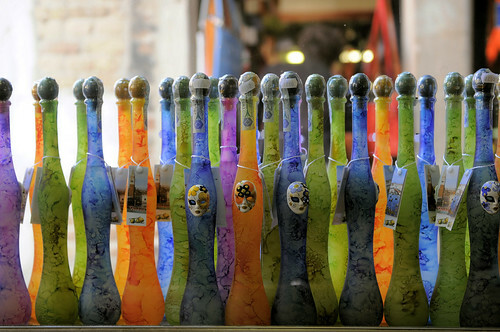 If you visit Italy, be sure to come home with one as a perfect souvenir! Have you checked ebay? That may be a good place to find large lots of glass bottles at a good price for such a project. Homemade limoncello sounds like a bit of tasty fun. Nice article! Great idea to buy limoncello as a gift.